Last year, I wrote about the Lenovo Keyboard I bought, and that I wasn’t a fan. It has its good points, but overall the lack of backlighting is a deal breaker. But I’ve found a keyboard that I can definitely recommend for the Home Theater PC enthusiast. 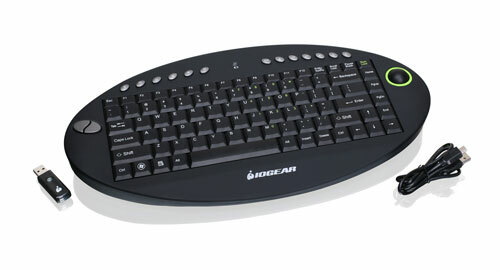 This IOGEAR wireless keyboard is not backlit either, but since it is a full-size keyboard and intended to sit in your lap, touch typing is easy. But the real story here is the ergonomics. They have built a well-designed trackball/button combo into the right side of the keyboard. There is no right-mouse button at this location, however. On the opposite end is a left/right button combo, which is a bit odd, but there is also a scroll wheel built into the front face for your left index finger to operate. This layout takes a little getting used to, but it works and I would say it works well. The entire case is covered with a rubberized coating that does not show fingerprints, which I like a lot, and it has rubber grips built into the bottom which makes it very comfortable to hold. The keyboard also includes a range of multimedia keys (that I guess are also programmable, although I haven’t tried to set that up yet). Overall, I am very happy with this upgrade to my HTPC.